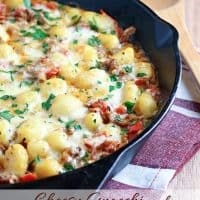 CHEESY GNOCCHI AND SAUSAGE SKILLET — Tender gnocchi pasta with Italian sausage and cheese cooks up in one skillet for a quick and easy meal! I love one pot meals! They make dinner time so much easier. I mean, who needs more dishes to wash? I especially love one pot meals when they’re as delicious and satisfying as this Cheesy Gnocchi and Sausage Skillet. 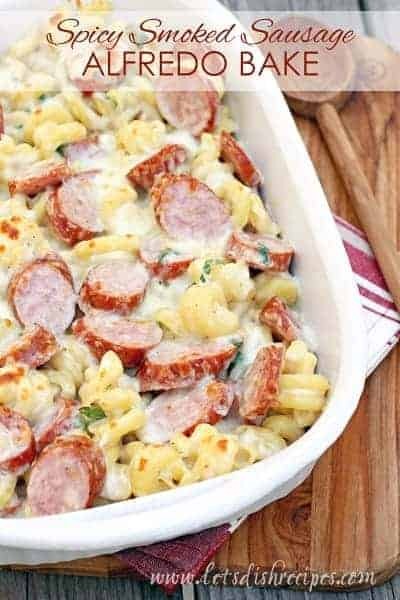 This meal was a huge hit with my family, and it’s no wonder, seeing as it’s loaded with pasta, Italian sausage and cheese. It’s amazingly hearty and there wasn’t one bite left over. I served it with a green salad and some garlic bread and everyone left the table happy. My husband and boys are already asking me to make it again. 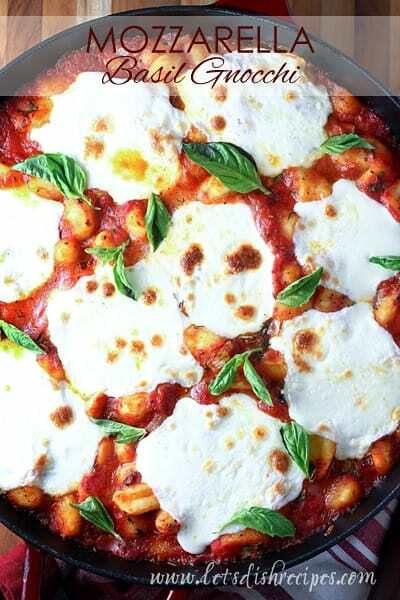 Gnocchi cooks up really quickly, so you can have this tasty skillet dinner on the table in under 30 minutes. I just love those little pillows of pasta! In fact, I try to keep some in my pantry at all times because I can always whip up a quick and delicious meal if I have gnocchi on hand. And when you smother gnocchi in a creamy sausage and tomato sauce, then top it off with melted cheese, it’s pretty much pasta perfection. Best of all, I only had one pot to clean when we were done eating. And I have no complaints about that! This one is definitely going into the regular rotation at our house. 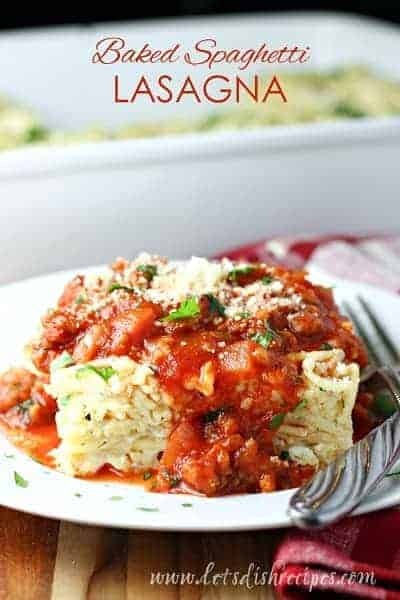 It’s exactly the kind of recipe you need in your collection for those busy week nights when you need to get dinner on the table in a hurry. Be sure to save this Cheesy Gnocchi and Sausage Skillet recipe to your favorite Pinterest board for later. Tender gnocchi pasta with Italian sausage and cheese cooks up in one skillet for a quick and easy meal! Heat olive oil in a large skillet over medium-high heat. Add gnocchi and cook, stirring frequently, for about 7-8 minutes, or until lightly browned. Remove from pan. Add the sausage to the skillet, and cook until no longer pink. Add the diced tomatoes, garlic, basil, oregano, salt and pepper to the pan. Bring to a simmer. Return the gnocchi to the pan. Stir in cream, and cook a few minutes more, until everything is heated through. Top with Mozzarella cheese. Place skillet under broiler for about 2 minutes, or until cheese is melted an bubbly. Who Dished It Up First: Adapted from Dinners, Dishes and Desserts. One pot – that’s my kind of dinner. YUM Danelle! Since we avoid fennel at all costs, we substituted regular hot sausage. It was like eating pizza. Anything with gnocchi tastes awesome! Tried making it with vegetarian sausage (my BF’s daughter is vegetarian). Waiting on the reviews. It looked good. Rave reviews…and they barely left a bowl for me. And was counting on not only a bowl for me but 2 lunch servings. Oh well guess, I’m tripling it next time. No boiling the gnocchi, correct? I generally have the packaged gnocchi in my pantry…it’s not frozen, but i wouldn’t call it fresh…is this the kind you use? I guess I’ve never seen true fresh gnocchi at the store. You can use the kind that is vacuum sealed, that you would keep in the pantry. You just wouldn’t want to use the dry, dehydrated version (more like regular dry pasta). Or if you did use that type, you would need to boil it first. This is a lovely dish. I have never had gnoccyans chose your recipe to try for the first time. I will definitely make it into the rotation. Thank you.